Erythrina fusca is a species of flowering tree in the legume family, Fabaceae. It is known by many common names, including purple coraltree, gallito, bois immortelle, bucayo, and the more ambiguous "bucare" and "coral bean". E. fusca has the widest distribution of any Erythrina species; it is the only one found in both the New and Old World. It grows on coasts and along rivers in tropical Asia, Oceania, the Mascarene Islands, Madagascar, Africa, and the Neotropics. E. fusca consists of legume pods reach 20 centimetres (7.9 in) in length and contain dark brown seeds. The seeds are buoyant, allowing them disperse across oceans. The tree is highly adapted to coastal conditions, tolerant of both flooding and salinity. 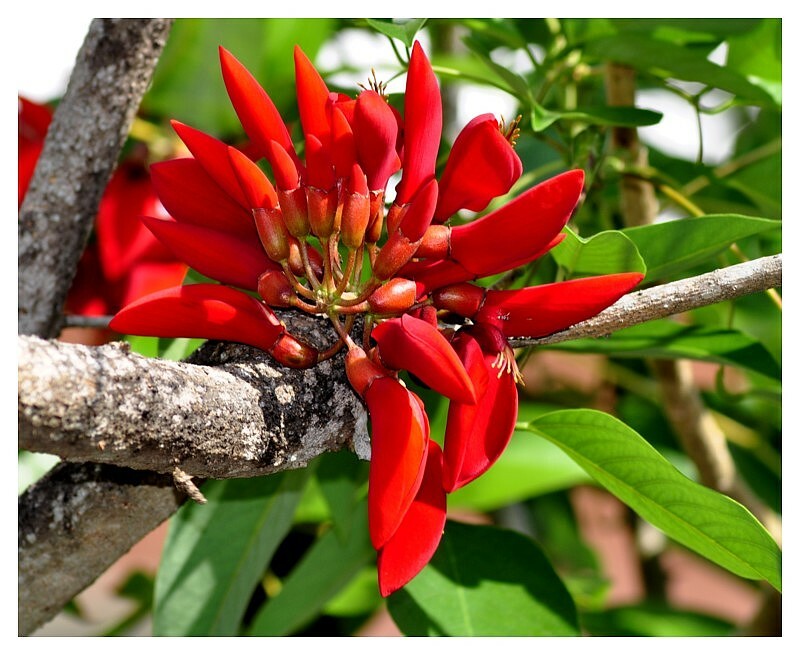 Like many other species in the genus Erythrina, E. fusca contains toxic alkaloids which have been utilized for medicinal value but are poisonous in larger amounts. The most common alkaloid is erythraline, which is named for the genus. The new buds and leaves are eaten as a vegetable. The easy-to-grow and attractive flowering tree is cultivated as an ornamental shade and hedge plant. It is a common shade tree in cacao plantations. It attracts hummingbirds, which pollinate its flowers. What a great flower have this lovely plant! I like this intensive red! A special flower, which I personally have not seen so far. Ciao Foozi. Great close up on this handsome coloured flower hitten by the light. Excellent DOF and sharp. Best conpliments. C'est un merveilleux macro et les couleurs de ces fleurs sont tr�s jolies ,les d�tails et la composition sont supers. Well captured colorful flowers with green leaves, beautiful. tfs. Hello Foozi. Impressive macro capture! Details, colours and composition are wonderful. What a splendid colours in this photo. Really perfect! Superb contrasts. Great sharpness, details and composition. Good POV and DOF. Lovely flowers, beautiful colors and fantastic details. Very well exposed, composed and framed. A great job! Well done & TFS! Impressively clear macro capture of these beautiful and atractive flowers. All are flawless. TFS and have a nice ay MF! Beautiful natural colours, great composition and sharpness. a very beautiful picture of Erythrina fusca, superb sharpness and fantastic vivid colours, a good visual impression. I must admit when first viewing your thumbnail image it looked like a bunch of red chili peppers. I then brought it up on the large screen only to find a beautiful cluster of vivid red flowering pods. Love the composition as it gives us a great view of this interesting plant. Great DOF and just the right exposure. Super work!! Gracias por compartir esta flor desconocida para nosotros. Another god image from an flowering plant with good pov and fine colours. Tr�s bonne valorisation du sujet dans une bonne composition sous une belle lumi�re et une excellente profondeur de champ. A bient�t sur TN pour de nouvelles aventures.